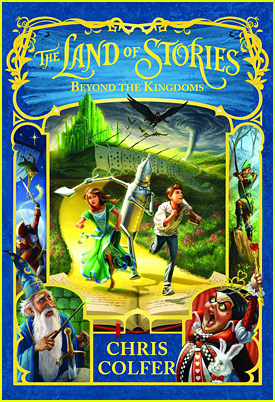 Hello there, I have finally been able to get my hands on the fourth ever-engaging book ‘Beyond the kingdoms” of the Land of Stories series and started reading it just yesterday. Just like the previous 3 land of stories books, this one has also had me reading for hours non-stop and completely enveloped in the book’s world leaving me craving for the next book. This book once again shows me how much power and magic, books, or in other words a few pages with a good, well written, story can hold, and I can assure you that good books like this can leave you dazed for hours, sometimes even days. “With only the help of the ragtag group of Goldilocks, Jack, Red Riding Hood, and Mother Goose and her gander, Lester, the Bailey twins discover the Masked Man’s secret scheme: He possesses a powerful magic potion that turns every book it touches into a portal, and he is recruiting an army of literature’s greatest villains! So, begins a race through the magical Land of Oz, the fantastical world of Neverland, the madness of Wonderland, and beyond. Can Alex and Conner catch up to the Masked Man, or will they be one step behind until it’s too late? I must say that this book has by far been my favourite in the Land of Stories series. With this book Chris Colfer has taken his writing to the next level – his way of intercepting classic stories dumbfounded me the day I read the first book – The Wishing Spell and continues to astonish me to this day. This book has left me with an extremely strong craving for the next one and i like to pamper myself, so you wont have to wait long!